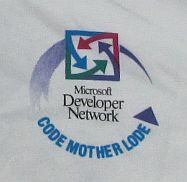 Here is a Microsoft Developer Network Dr. GUI T-Shirt T-Shirt handed out at a Microsoft event. The T-Shirt is a Hanes Beefy-T L Adult size. The T-Shirt has never been used.